A short updateon a crucial and current subject: Healthcare. (For the very latest follow-up and/or dissection of the process click here) The matter is of a global and complicated interest, but at this point do US employees still care? The subject goes "over the head" of many, has become more of a political duel rather than being approached as a public health concern with serious economic impacts. For the sake of information and communication on the subject, I will give a quick snapshot on the matter in this post. 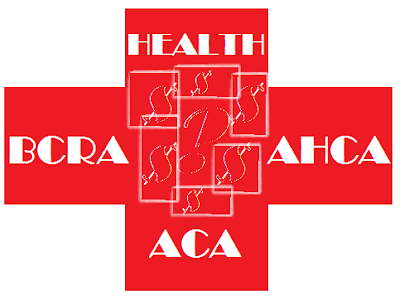 We remember (or don't) that ACA stands for the Affordable Care Act or "Obamacare", the AHCA is the American Health Care Act, and the latest is the Better Care Reconciliation Act (BCRA).